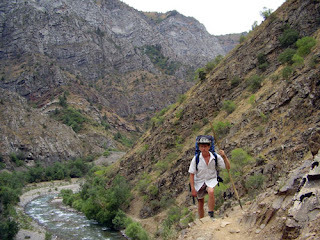 Chimgan is where Uzbeks head to escape the summer heat, indulge their passion for winter sports (skiing and snowboarding) and hike in the glorious mountain ranges during spring and autumn. 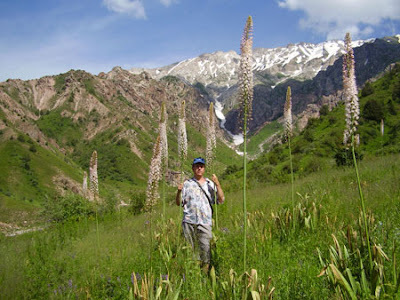 Located 85 kms east of Tashkent, Chimgan is on the spurs of the Chatkal range of the western Tien Shan mountains, in the Ugam-Chatkal National Park. The main peak of the entire mountain area, Greater Chimgan, is an impressive 3309 metres. The area was already popular in Tsarist times: the Governor of Turkestan built his country house there. Later, Russian army doctors had a hospital built to take advantage of the healing properties of mountain air. It is also where Uzbeks have had their dachas for generations, grown vegetables and fruits and pickled them for winter. Last October I spent a marvellously clear autumn day hiking around the area near Beldersoy with Vasiliy Eremin. 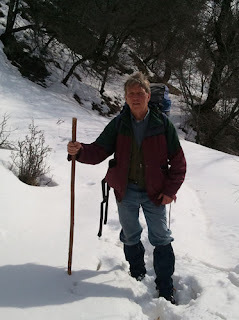 A Moscow-trained teacher of the accordion and other musical instruments, Vasiliy's passion is mountains. He hikes year-round and knows this region like the back of his hand. Vasily is excellent in naming plants and trees (in English) along the way. If he didn't know it, he checked his Russian-English dictionary app to ensure my query was answered! The beginning of the trail was steep and stony as we hiked up to the Mramornaya river (altitude1500m) then followed the stream to the Urta Kumbel Pass (1850m) then down to the Beldersay river gorge. Vasiliy had prepared a delicious picnic lunch of non (Uzbek bread), cheese and salami, plus kishmish (sweet, small raisins from his garden). After lunch we hiked up to the second pass, Chet Kumbel, 1880m. The views of the Western Tien Shan mountain range were beautiful. The landscape was more forested, the silence and stillness perfect. We simply walked along companionably, crossed the cable car station and then back down to the hotel. Chimgan is also a special place for bird watching. Ornithologists have noted over 40 species in the area including the tawny owl, the Egyptian vulture, the blue-whistling thrush, the white-capped bunting and the red-headed bunting. (The first book on Uzbek birds in a bilingual English/Russian edition has just been published). If hiking or birdwatching appeals to you, Uzbek Journeys can arrange two and three-day excursions to Chimgan staying at the Beldersay resort hotel. And, if you like, Vasiliy may bring his guitar.